LSBU is committed to delivering course programmes, academic initiatives and research projects focused on sustainable development. 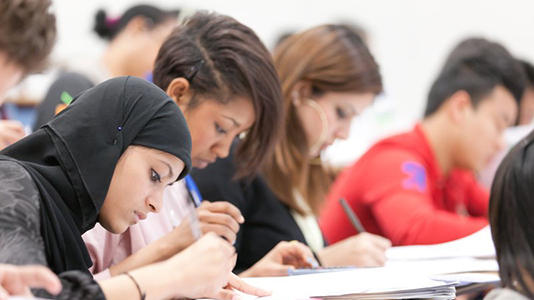 LSBU is committed to delivering course programmes, academic initiatives and research projects focused on sustainable development. See below for examples of LSBU's education for sustainable development (ESD) initiatives. The Curriculum Working Group is led by Dean Prof. Charles Egbu. The group comprises academic colleagues from across London South Bank University’s seven schools. In the 2016/17 academic year, LSBU initiated a multi-disciplinary course evaluation process whereby a detailed review was made to research the current provision of sustainability content within LSBU’s undergraduate and postgraduate courses delivered in the 2016/17 of teaching. Course content was reviewed from a three-way perspective - economy, society and biosphere/environment – in line with the three “pillars” of the United Nations Sustainable Development Goals (SDGs). Officially known as ‘Transforming our world: the 2030 Agenda for Sustainable Development’, the UN SDG’s set out the road map (2015- 2030) that universities including LSBU can navigate towards to meet the seventeen aspirational ‘Global Goals’ (supported by 169 targets). The results from the preliminary assessment look very promising. However, follow-up activity is now required to verify the level of sustainability content within our courses, e.g. whether “high, medium or low”, as well as to make recommendations for further embedding of sustainability thinking to the courses, where practical. This will be a priority action for 2017/18 academic year as a means to validate the on-going integration of further sustainable development content into the LSBU curriculum. This most recent work builds on past work Gail Langley completed in 2015 at LSBU to identify Education for Sustainable Development activity across teaching and learning. Prior to that, Dr Deborah Andrews also undertook a comprehensive review of the status quo of ESD within the curriculum, so LSBU is able to demonstrate continuous improvement in this field. Prof. Ros Wade has facilitated a sustainability session at a Faculty Meeting for staff, and is constantly promoting the sustainability agenda in her capacity as Course Director for the Education for Sustainability programme and as Director of the London Regional Centre of Expertise. Prof. Pat Bailey is also a Council Member of the Regional Centre of Expertise. London South Bank University, in collaboration with the RCE London, hosted an open day for refugees, their families, friends and supporters on 24 June 2017. Prior to that, LSBU hosted the meeting of the European Regional Centres of Expertise on 23 and 24 June 2016. Sustainability is embedded into the Product Design and Engineering Product Design courses from the first year, including a specific Design for a Sustainable Society module; sample assignments include design for dementia, reducing food waste and reusing waste from the hospitality industry. All students learn about sustainability principles and apply them to design projects. A number of postgraduate courses also include sustainability: the Masters in Engineering Management module about Energy, the Environment and Product Life Cycle introduces students to sustainability prior to developing alternative thinking about the engineering, design and current practice in these fields. In MSc Sustainable Energy Systems students consider the broader implications of what they are studying in the Energy Resource Use and Analysis module, measuring Life Cycle impact as well as considering the use of renewable energy systems. Our second year Chemical and Petroleum and Mechanical Engineering students also cover sustainability and sustainable engineering. The School of Business addresses key sustainability issues through the following modules: Environmental Economics and Sustainability; Business Risk Management and Knowledge; Globalisation and Development; Sustainable Development and Global Citizenship. The National Bakery School also covers sustainability in the following modules: Business/Environmental Management and QM Best Practice; Food Regulations and Sustainability; and Food Control and Sustainable Practice. Dr Delia Ojinnaka gives an annual lecture on food security and sustainability at the University of Valencia, Spain. If you want to develop an environmental project as part of your course, get in touch with the Sustainability Team. The following is a list of courses (a mixture of undergraduate and post-graduate) that London Southbank University offers that feature sustainability in one or more of their modules. LSBU plays an active role in encouraging and engaging students and staff to get involved in sustainability initiatives across campus. This helps us make continual improvements in what we do and delivers the long-term change that is required in order to address the challenges society faces. Fundamentally, this engagement has the most significant impact when a student or staff member embeds these values into their lives. LSBU has supported a student to develop a free-cycling app for students and staff to offer and exchange items for free on campus in order to reduce the amount sent to landfill each year. Find out more about the Elephant app. The Sustainability Team works with Product Design students to assess opportunities to develop roof spaces into gardens. The students' designs are then assessed through their coursework and presentations. As part of their coursework, Product Design students develop posters and campaighn ideas to improve recycyling rates and visibility across campus. MSc Marketing students have developed a marketing plan for a free-cycling app and identify innovative ways to help reduce waste on campus. LSBU supported an Engineering student to create, deploy and analyse a university-wide travel survey for their dissertation. This was crucial in understanding the travel habits of students and staff and the associated environmental impacts. Photography students take a tour of the heating and hot water systems in our buildings, led by LSBU Estates Maintenance engineers. Their photographs tell the story of LSBU's investment in energy efficiency and capture the strange beauty of this hidden but very important work.